Original Owner — Hesse, John C.
Architect — Plager, W. S.
Builder — Barkman, Geo. W.
Original Owner — Hesse, Henry A. Original Owner — Harrison, B. D.
 Alexander T. Stuart (principal, Wallach School); Sallie M. Dodson (servant). Jennie Thompson (servant); William Burris (patents). Georgie Carter (servant); Mahaney Gross (servant). Alexander P. Steward (clerk, Treasury Department). Arthur P. Steward (clerk, Treasury Department); Edna Grubb (dressmaker); Richard W. Smith (clerk, Post Office Department). Arthur P. Steward (clerk, Treasury Department). Arthur P. Steward (clerk, Treasury Department); Watson Smith (clerk); Thomas G. Steward (clerk, Patent Office). Annie E. Ober (clerk, Pension Office); Florence M. Miller (clerk). Mary E. Pettis (clerk, Pension Office); Arthur B. Smith (proof-reader). Samuel P. Paul; Arthur B. Smith (proof-reader). Francis Kittel; Samuel P. Paul; Edward C. Stevens (clerk, Pension Office). Grace L. Anderson; Eugenia H. Levering (widow of Righter Levering); Augusta E. Stewart (widow of George L. Stewart); John H. Anderson (clerk); Samuel P. Paul. John H. Anderson (clerk); Eugenia H. Levering (widow of Righter Levering); Augusta Stewart (widow of George L. Stewart); Esther L. Sweet (widow of Foster F. Sweet); Sarah E. Sweet (clerk, Pension Office). Eloise Sweet (student); Esther Sweet (widow); Eva Sweet (clerk); Sarah Sweet (clerk, Pension Office); James H. Anderson (clerk); Eugenia H. Levering (widow of Righter Levering). George M. Slye (collector); Emma Robertson (clerk, Pension Office); William C. Watson (publisher); Albert T. Robertson (clerk). Hattie M. Bruff (nurse); Charles Fernald (civil engineer); Charles W. Sears (Fire Department). Emmett R. Bruff (naval student); Harriet M. Bruff (nurse). Charles Franold (foreman); Prentiss A. Shreve (laborer). Margaret B. Fields (professional nurse). Harry A. Calohan (insurance); Steingrimur Steffansson (Library of Congress); Thornton T. Thomas (clerk, General Land Office). Steingrimur Stefansson (Library of Congress). John H. Ward (Fire Department). Joseph H. Ward (Fire Department). Harry A. Calohan (insurance agent); Richard L. Gholson (Fire Department). Jesse H. Tomkins (manager); Richard L. Gholson (Fire Department). Millard F. Alley (clerk); Roscoe Alley (clerk). Millard F. Alley; William Van Buskirk. Leroy C. Risler (“cndr” [?]). Frank C. Curtis (clerk); Millard F. Alley. Milliard F. Alley (grocer); Joseph English. Joseph B. Pannill (agent, Prudential Insurance Co.). Joseph B. Pannill (agent); Harry L. Sackett (auditor, Treasury Department); Mrs. Nettie Bell (clerk, Kann’s); N. B. Bell (clerk). John J. O’Connell; Mary E. Ennis (nurse). John G. Norris; Catherine M. Sullivan. John G. Norris; Stephanie L. Lee; Catherine Martinez. Washington Evening Star, 27 March 1931, p. 4. Washington Evening Star, 4 March 1951, p. 32. 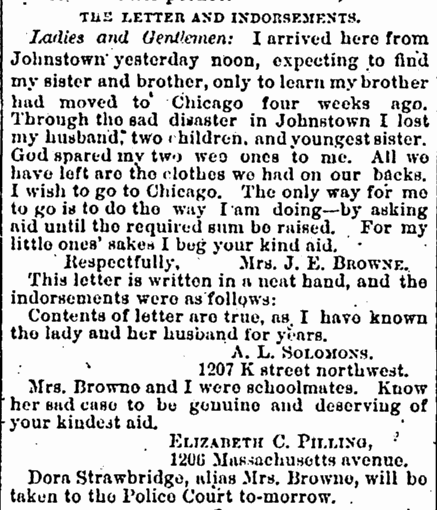 “Social Matters.” Washington Evening Star, 6 February 1891, p. 3. 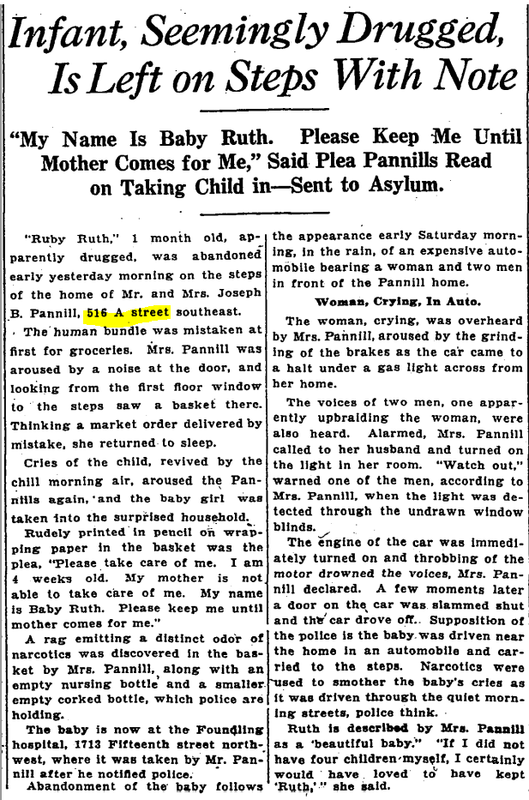 Washington Evening Star, 2 July 1889, p. 3. 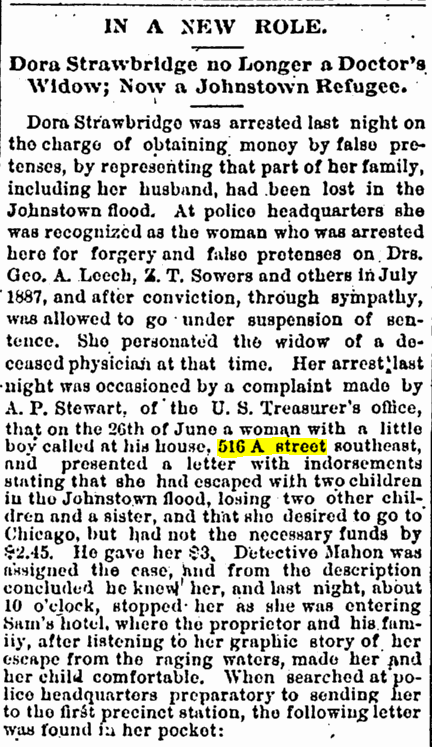 Washington Evening Star, 26 May 1883, p. 4. Federal census, 1930, 516 A St., S.E., Washington, D.C.
John O’Connell (owns, value of home $2,000), head, has radio, 55, married, 30 at first marriage, born in Mich., father born in Ireland Free State, mother born in Ireland, police, U.S. government, veteran. Elizabeth O’Connell, 55, married, 30, 30 at first marriage, born in Michigan, parents born in Irish Free State, not employed. Mary A. O’Connell, daughter, 20, single, attending school or college, born in D.C., parents born in Mich., clerk, U.S. government. John J. O’Connell, son, 19, single, attending school or college, born in D.C., parents born in Mich., clerk, U.S. government. Frances M. O’Connell, daughter, 17, single, attending school, born in D.C., parents born in Mich., not employed. Federal census, 1920, 516 A St., S.E., Washington, D.C.
Arthur I. Goardsmoe, head, rents, 27, married, born in Minn., parents born in Norway, parents speak Norwegian, clerk, Civil Service. Elizabeth J. Goardsmoe, wife, 25, married, born in Penn., parents born in Penn., not employed. Elizabeth J. Goardsmoe, daughter, 14 months, born in D.C., father b. in Minn., mother b. in Penn. Eric Goardsmoe, son, 2 months, born in D.C., father b. in Minn., mother b. in Penn. Edgar Goardsmoe, brother, 20, single, born in Minn., parents born in Norway, accountant, Treasury Department. Caroline Lester, mother-in-law, 55, widow, born in Penn., father born in Penn., mother born in Ohio. 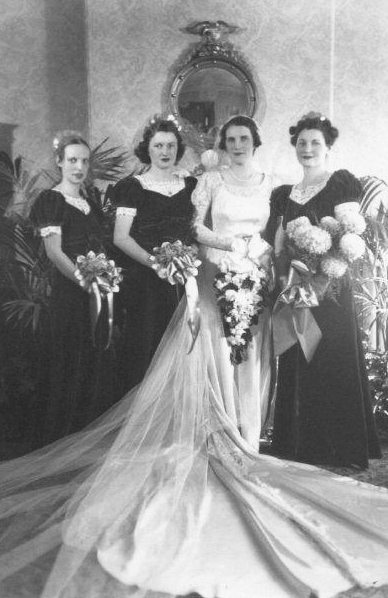 [From left] Nora Tappan, Mary McGinnis, Frances O’Connell Freund, and Mary O’Connell (later Hepburn). The photograph was taken in the parlor of 516 A Street, S.E., on 31 October 1938, the day of Frances O’Connell’s marriage to William Freund. 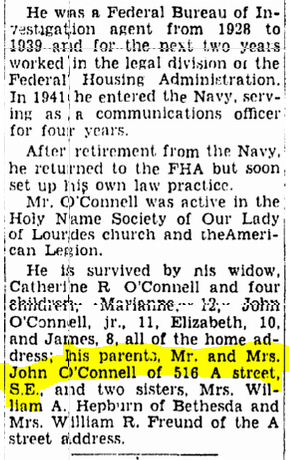 Federal census, 1940, 516 A St., S.E., Washington, D.C.
John O’Connell, head, 65, value of home $8,000, married, completed 7th grade, born in Mich., at same house in 1935, not employed, worked 36 weeks in 1939, income $2,000. Elizabeth J. O’Connell, wife, 66, married, completed high school, born in Mich., at same house in 1935, not employed. 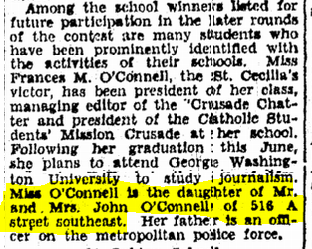 Mary A. O’Connell, daughter, 30, single, completed 5 years of college, born in D.C., at same house in 1935, record clerk, Library of Congress, worked 52 weeks in 1939, income $1,680. William R. Freund, son-in-law, 30, married, completed high school, born in D.C., lived at same place in 1935, accountant, District Building, worked 52 weeks in 1939, income $1,620. 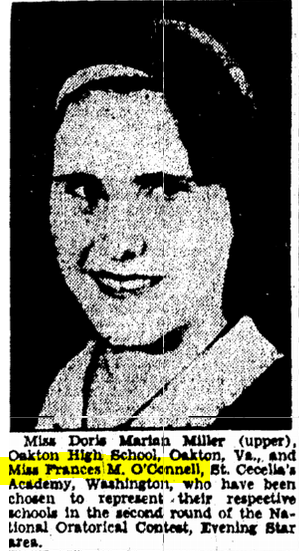 Frances M. Freund, daughter, 27, married, completed 2 years of college, born in D.C., lived in same place in 1935, clerk, U.S. government, worked 52 weeks in 1939, income $$1,440. Washington Post, 21 August 1923, p. 2. Washington Post, 25 August 1923, p. 3. 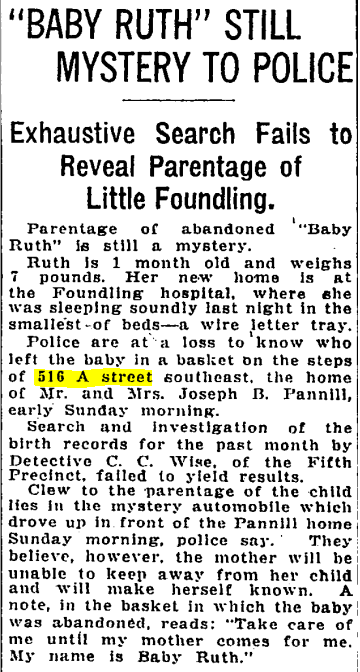 “Vital Statistics.” Washington Post, 7 July 1937, p. 24. 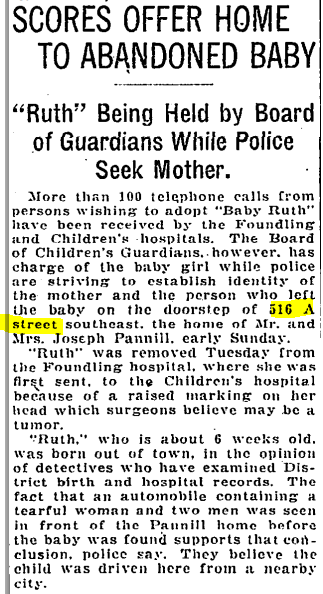 Washington Post, 13 May 1931, p. 22. Washington Post, 20 August 1923, p. 1.